In a recent interview, former Pride heavy weight champion Fedor Emelianenko spoke candidly about fighting in the UFC (Ultimate Fighting Championship), when his next fight is scheduled to take place and his deferred matchups with Josh Barnett. “The Last Emperor” also shared his thoughts on heavyweight kingpin Junior dos Santos and his opponent at UFC 146, Alistair Overeem. In addition, the Russian fighter set the record straight regarding the rumors surrounding a projected contest with former UFC champ Cain Velasquez. Furthermore, he picked his top five MMA (Mixed Martial Arts) heavyweights in the world. The original translation and transcript was reported by Fightersonlymag.com. Your promoter Vadim Finkelstein, has recently said that his next fight you will spend the summer or fall. Can you say anything more specific about this? The time when the battle will take place, I can name right now - it's June or July. But at the place where the fight will take place, we have not decided yet. A fortnight ago, M-l Global’s director of operations, Evgeni Kogan told MMAFighting that there was the possibility Fedor’s (33-4-1 MMA) next fight would take place in the summer of June or thereabouts. That said, the MMA legend scored successive victories over Jeff Monson and more recently against Japanese judoka Satoshi Ishii on New Year’s Eve at Fight For Japan: Genki Desu Ka Omisoka 2011. 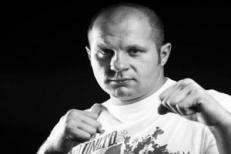 Prior to the aforementioned wins, Fedor had signed with the San Jose-based promotion Strikeforce. It was there he would lose his 28-fight unbeaten streak which he’d kept intact for nigh on a decade. On his debut for the company, he steamrolled Brett Rogers. However, his next three and final outings were a complete catastrophe. He was submitted by Fabricio Werdum, then suffered a TKO loss courtesy of Antonio Silva and finally he was knocked out by Dan Henderson. Where would you most like to fight: Russia, Japan, where you will enjoy almost as much as at home, or maybe in the U.S.? Of course, I would like to come home for his countrymen. But by far the most powerful and influential organization of MMA is located in America. This UFC. Therefore, to meet with the best fighters I have to travel to the United States. It has been well documented that the UFC brass—president Dana White in particular—were once keen to sign Fedor to the company, but due to negotiations fallen through with M-l global, nothing has come to fruition as of yet. With White’s sign of approval and Fedor’s indication that he’d like to contest against the world’s best combatants—that, as it happens, currently reside in the Zuffa-based promotion—then there is the possibility Fedor’s wish could come true. One of the most intriguing fights in your career could be a fight with Josh Barnett. But in 2009 he never took place. Would you still meet with the American? And what are the chances that soon you will rival a similar level? Vadim is currently in talks about it. Much depends on it. I think in the near future, the situation becomes clearer. As for Burnett, it was the third time, when we broke off the fight with him. But to be honest with him I would not want to fight. I really sympathize with Josh, and we had been friends for a long time. Perhaps he is the only fighter with whom I had not wanted to meet in the ring. "The Warmaster” Barnett who was recently granted a license by CSAC (California State Athletic Commission) to fight in the State of California is slated to throwdown with Daniel Cormier in the Strikeforce Heavyweight Grand Prix finale, which has been penciled in for May 19. In Las Vegas, May 26 will fight for the title of champion of the UFC heavyweight division between the Brazilian Junior dos Santos and the Dutchman Alistair Overeem. Do you think they are the strongest at the moment the men in the world? Yes, I think they are one of the strongest heavyweights at the moment. Alistair “Demolition Man” Overeem is currently ranked the No. 2 heavyweight in the world and booked his spot for a tilt at the title when he upended former champ and recently retired MMA fighter Brock Lesnar at UFC 141. Conversely, “Cigano” dos Santos, who has been convalescing from a knee injury, captured the division’s coveted crown with a first-round KO of Velasquez at the inaugural UFC on FOX main event. Recently in the U.S. press reported that you can meet with former UFC champion in the heavyweight Cain Velasquez. What can you say about this? We do not have agreements. To date, no certainty in the relationship with the UFC does not. Maybe in the near future, something clear. Velasquez calls you his idol, and says that he considers you the best heavyweight of all time. You can select the fighters, even completing a career that made the greatest contribution to the development of mixed martial arts? I am interested to watch the performances of the top five rankings UFC. Contribution to the development of MMA? If we go by personalities, it's all the same Barnett, Mirko Filipovic, brothers Nogueira, Randy Couture. Velasquez is expected to lock horns with Frank Mir sometime in the summer, whilst Antonio “Minotouro” Nogueira will clash with Alexander Gustafsson at UFC on FUEL TV 2 in Stockholm, Sweden next month. Meanwhile, Antonio “Big Nog” Nogueira, who suffered a broken arm via Mir's kimura submission, is on the mend and could be in action before the year’s end. Randy Couture (a former UFC two-division titlist) and Mirko Filipovic (a Pride legend and UFC resident) are both retired mixed martial artists.